Take notice here because Bill Belichick’s boys are one of fantasy football’s behemoths. The New England Patriots have ranked in the top ten in points per game going all the way back to 2004, a total of eight seasons. And with offensive coordinator Josh McDaniels back in the mix, there’s a great reason to believe they will make it nine straight seasons. The previous weekend was a rather turbulent one for the Indianapolis Colts. It was capped, of course, with another loss, this one a 31-7 drubbing at home to the Atlanta Falcons on Sunday. Depending on one’s perspective, however, the loss might have been a blessing, as the Miami Dolphins, who until Sunday were the NFL’s only other winless team, beat the Kansas City Chiefs 31-3 for their first win of the season — giving the Colts the inside track for the No. 1 pick in the NFL Draft and its prospective prize, Stanford quarterbakc andrew Luck. But those weren’t the only story lines surrounding the Colts during this rough weekend. What was the best day in New Orleans Saints franchise history was the worst day for many Indianapolis Colts fans. With Super Bowl XLIV, which the Saints won 31-17 after recovering an onside kick at the beginning of the second half and then returning a Peyton Manning interception for a touchdown, now far in the rear-view mirror, these two teams meet again, albeit with much different looks. What kind of chance will the Colts (0-6) have at avenging their Super Bowl loss tonight at 8:20 p.m. at the Louisiana Superdome — without Manning? Last Thursday I called for and expected Curtis Painter to be the Indianapolis Colts’ starting quarterback for tonight’s prime-time affair with the Tampa Bay Buccaneers (2-1) at Raymond James Stadium. He indeed will get such an opportunity. With previous starter Kerry Collins still experiencing concussion-like symptoms, Colts coach Jim Caldwell said Friday that Painter, a third-year player out of Purdue, would get the nod for the team’s lone appearance on ESPN’s Monday Night Football this season. What to make of this decision? It could result in a very telling outing by the Colts one way or the other. We’re three weeks into the fantasy football season and the surprises just keep on coming. 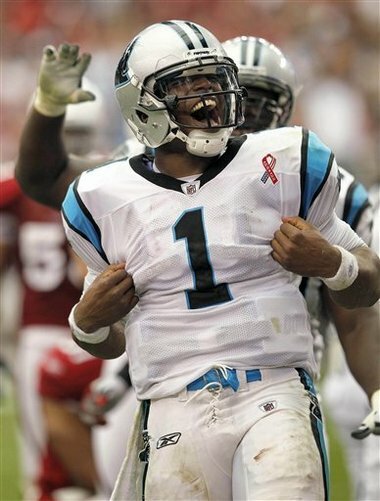 Cam Newton and Matthew Stafford are top-10 fantasy quarterbacks. Coe College alum Fred Jackson is the third best fantasy back. And how about Scott Chandler, who had one catch before this year, picking up four scores in the first three weeks. But much like business, it’s not what you did last week; it’s what are you going to do for me now. So let’s look into the crystal ball and find this weeks surprise, shall we? The Indianapolis Colts indeed fell to 0-3 Sunday night at Lucas Oil Stadium as many predicted they would. I’m sure few people, however, predicted that a loss that dropped the Colts to 0-3 would feel so good. The Colts put forth a stellar effort on the field and pushed the Pittsburgh Steelers to the brink in a 23-20 loss. Steelers kicker Shaun Suisham kicked a 38-yard field goal after a late drive by Ben Roethlisberger to seal the deal with four seconds to play. But what an encouraging and much-needed display by the Colts, even with the end result. After two bad losses to open the 2011 NFL season, the Indianapolis Colts are close to confirming everyone’s worst fears about the team without Peyton Manning. Tonight’s prime-time matchup with the defending AFC champion Pittsburgh Steelers (1-1) at Lucas Oil Stadium can either establish one and for all that the Colts can’t contend without their four-time MVP starting quarterback, or it can be a proving ground for them to show that they can. But the Colts aren’t the only ones who have something to prove at tonight’s game. Colts fans do, too. It shouldn’t surprise any of us. In a game as violent as football, injuries are bound to happen. Top-5 pick Jamaal Charles is out for season. Miles Austin is out until October 16th. Let’s not even get started on Peyton Manning. Much like their professional counterparts, fantasy owners need to find ways to fill the void left by their injured players. Included in this week’s rankings, I’ll list some guys that could step in for your injured star this week. So it’s really going to be this way. The Indianapolis Colts really are struggling this mightily without Peyton Manning at quarterback, as evidenced in Sunday’s 27-19 loss to the Cleveland Browns in the team’s home opener at Lucas Oil Stadium. The Colts, 0-2 for the first time since Manning’s rookie season, lost 34-7 to Houston in Week 1, but the Texans had a much better pass rush than the Browns, and the Colts defense played in a similarly sluggish fashion against Houston in last year’s season opener. You’d figure the Week 2 matchup with Cleveland at home would be a better indicator of how the Colts can do without Manning. It was.